Naked Coconuts is company that bases their products on being environmentally conscious, commits to animal welfare and transparency. Their products are coconut-oil based, and are gluten-free and vegan. I only partner with companies or businesses that I would use myself, and would recommend to friends and family. 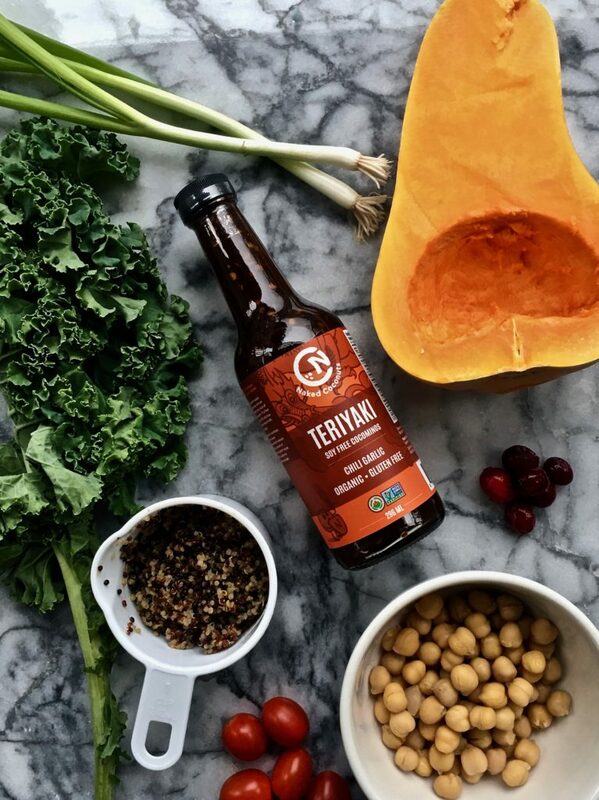 I’m always on the hunt for healthy food so I’m happy to introduce soy-free sauces to everyone I know. I created two dishes with the soy-free teriyaki sauces. Both dishes were inspired by Instagram Guru’s photos, but I didn’t look up any specific measurements or recipes. My first vegan dish was inspired by @alphafoodie on Instagram. Her feed is so aesthetically pleasing, with the beautiful images she captures of bright, fresh fruits and vegetables. I decided the Chili Garlic Soy Free Teriyaki sauce would work perfectly with this dish. I know that butternut squash is buttery and nutty. 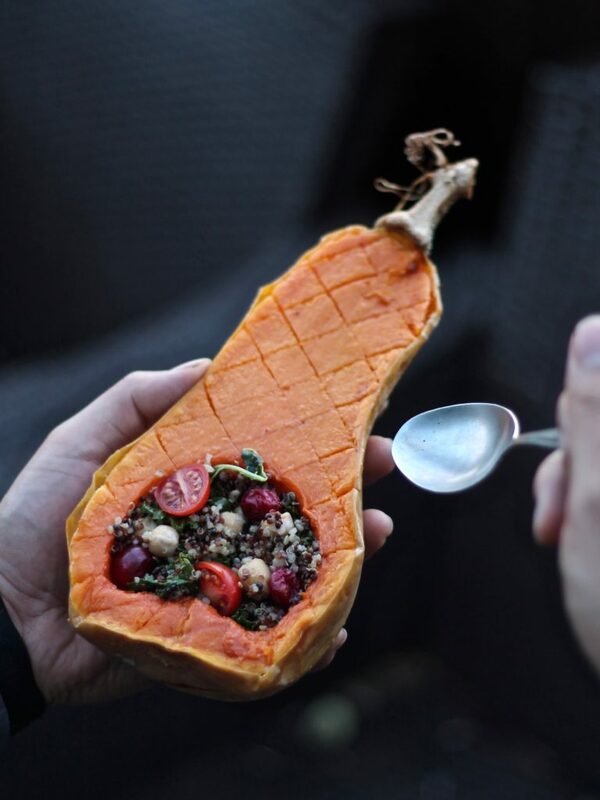 I thought that the sweetness from the teriyaki would blend well with the squash, and the kale, chickpea, quinoa salad would add the protein element to the dish. I added cranberries for tartness, tomatoes because I love tomatoes, and scallions for taste. This dish comes out looking impressive, but is super easy to make! My second vegan dish was inspired by @erinireland, one of Vancouver’s most recognizable Vegans. Her delicious dishes and detailed Instagram stories always trigger that burning question in the back of my mind- should I go vegan? It’s a question I’ve asked myself many times over, as I do believe that it is a lifestyle change that would make me feel good about myself. I often feel like a walking hypocrite, as I’m a huge animal lover, yet live as an omnivore. I know this can be a controversial subject, and I’m often debating with myself when it comes to this topic. I’m going to reduce my meat consumption starting in January, and I’ll see how it works out. Onto the dish! 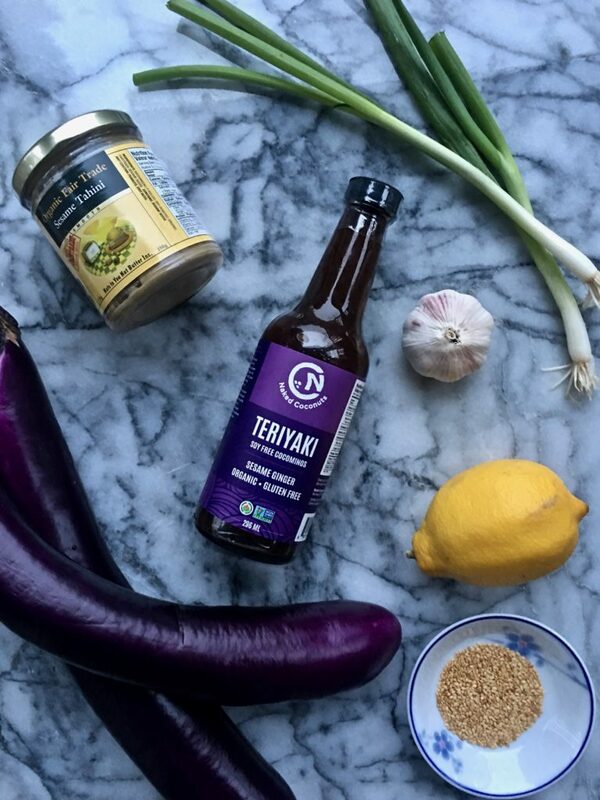 The Sesame Ginger Soy Free Teriyaki made me think of creating a dish with eggplant. 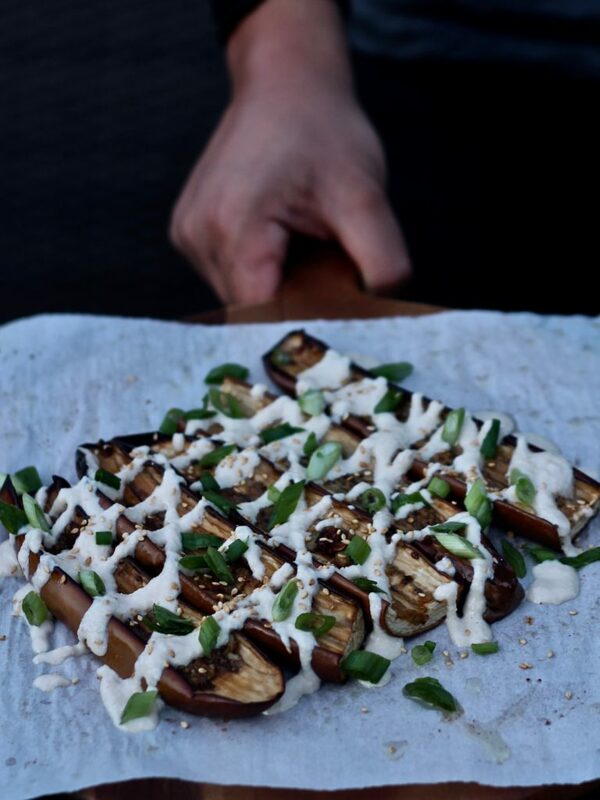 Eggplant is one of my favourite vegetables, and I absolutely love eating them baked. I made a garlic-tahini dressing to drizzle over the teriyaki-marinated eggplant, topped with scallions and sprinkled toasted sesame seeds for extra texture. Served with lemon wedges for some acid, and this dish checked off all of my boxes. The garlic-tahini dressing added a great creamy/saucy element. This was also super easy to make! Thank you Naked Coconuts for partnering with me!